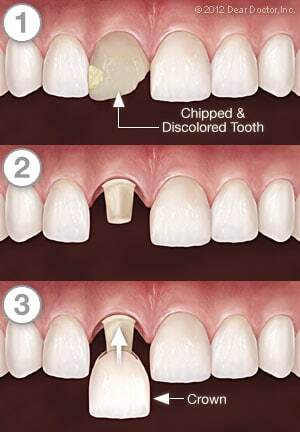 Over time teeth can become weak or severely worn down, leading to decay, cracking, and breaking. This can cause pain and embarrassment. At AV Sierra Dental Center, Palmdale dentists Drs. Oh and Couto can restore your teeth to the right size, shape, and strength, alleviating your discomfort in the process. A natural-looking, custom-made concealment called a dental crown can be fit to your broken tooth, returning your smile to its beautiful, natural state. The process for creating and fitting dental crowns takes place over two to three visits across two or three weeks. Dr. Oh or Dr. Couto will first remove all decay; then the damaged tooth is sculpted and prepared for being fit with a crown; and finally, an impression of your tooth is made for creating the custom tooth crown. You will be fit with a temporary crown while you wait for the permanent one to be made. When your crown is completed, Dr. Oh or Dr. Couto places it onto the permanent tooth, ensures the fit and look are correct, and cements it into place. At AV Sierra Dental Center, our priority is to deliver gentle, compassionate care. This commitment, combined with our sedation options, ensures that receiving a crown is a comfortable experience. To learn more about how crowns can restore your smile, call 661.202.3542 to schedule an appointment with our Palmdale dental office.